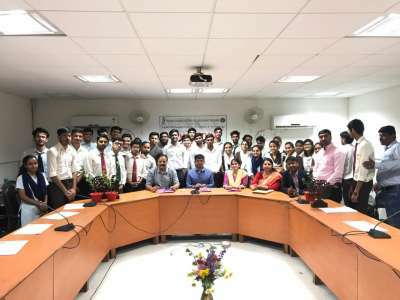 The annual function for Faculty of Computer Science was held on 13th April,2019. The function was inaugrated with lamp lighting of Saraswati Mata by Chairman Sh. Praveen Mathur, Principal Prof. Rajeev Mathur and Director Prof. Priyadarshi Patni. Musical bands, solo and group dance performances by the students of the faculty were appreciated by one and all. Prize ditribution of the sprorts event earlier held was also done. Students of the Winning and runner up teams of the various sprorts events were presented with medals , jerseys and 'CHAL VAIJYANTI'.The function ended with a vote of thanks for the Director. 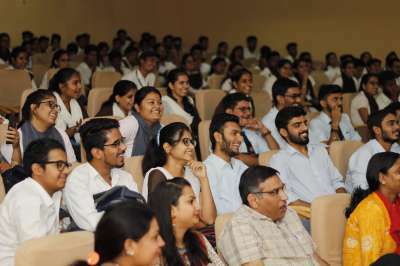 Convocation ceremony of TISS-NUSSD programme was organized on 02 April 2019. 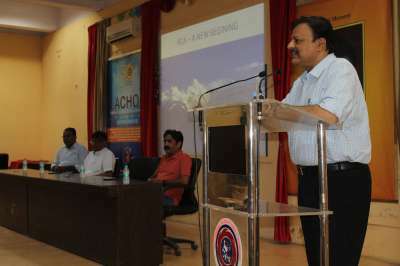 Chief guest of the function was Mr. Ashok Choudhary, Executive Director, FDDI. College Principal Prof. Rajiv Mathur , Dr. Vandana Gupta and NUSSD Team participated in the ceremony. Total 46 students were certified in Certificate in Management and Soft Skills. 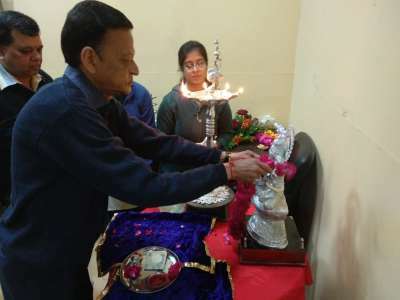 Annual day function was celebrated on 31 Mar 2019. Prize distribution and cultural events was organized in it. BSCH 411: Unit 2 Chemistry of transition metals. BSCH611: Unit 2, Unit 3: Thermodynamics and kinetic stability and factor affecting them. BSCH 612: Unit 3 : Spectroscopy ll: Raman spectroscopy and electronic transition spectroscopy. WAQIF- Derived from the language of heart - Urdu, which means aware. Waqif made the people of our college aware of the literary talent that they possess and demonstrated it to the audience. Continuing the legacy of Waqif - season 1, this time we celebrated WAQIF - Season 2 on 24th & 25th Feb 2019. Starting from Painting to The Rocking performance our bands. JAM - It was a Just A Minute, in which students were given topic on which they need to speak one minute without repeating the word and without stammer. 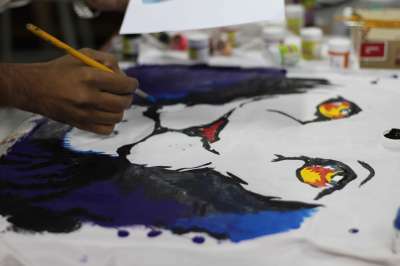 TULIKA- The students were provided with a sheet of Canvas on which they Painted their beautiful ideas and imagination. EXTEMPORE : In this activity the students were given some really interesting topics on which they need to speak for 1. Topics were of both Hindi and English language. SHUTTERBUGS - A Concept was given to the participant along with a time limit and the result was the beautiful click of our city. From Clock tower to our Palace every famous thing was clicked in just one frame. 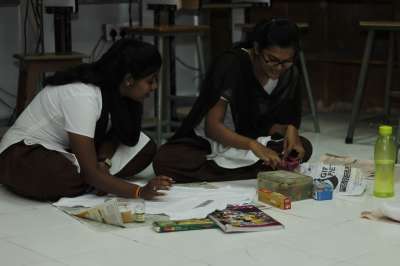 60 SEC TO FAME - In this activity the students were given some most innovative and craziest tasks that they need to o complete within 60 seconds. COFFEE WITH LS -While sharing coffees and ideas with the dynamic students and faculty members of our college. Respected Patani sir was our host for this event. BARFI- The Mute act where the actions will speak instead of your words. 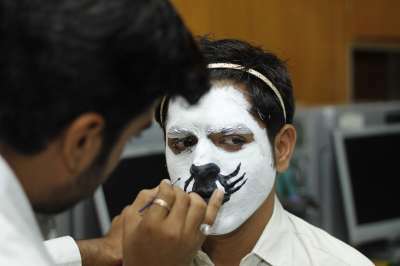 It was a drama activity in which different teams from all the department performed. WAQIF- As The name itself can make you realise that it is the heart of the whole event. An open mic event where you can speak out your poetry, do storytelling, stand up comedy, etc. WAQIF - Season 2 was a great success for our college and we look forward for the Season - 3 in the upcoming sessions. It was the first time that students of Lachoo from various backgrounds & with diversity of talents were sharing a single stage. Some of these talents were Poetry, Singing, Vocals, Dancing & Drama as well. As the Names goes HAYAAT i.e. 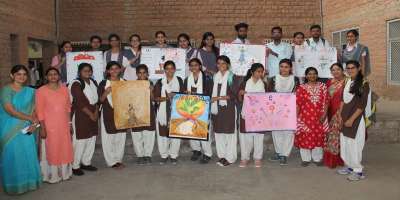 Life, students came up with really beautiful and interesting stories related to our life and giving a strong message at the end. Meanwhile the Student of Literary Society also gifted LMC ANTHEM of our respected Principal DR. RAJEEV MATHUR SIR. 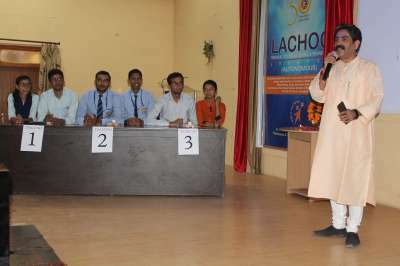 Students of Lachoo Memorial college but also gained the among the other people of Jodhpur city. 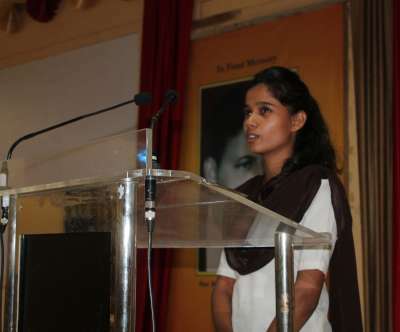 Harshita Bhati, B.Sc. IV Sem student of LMCST participated and represented Rajasthan in republic day camp 2019 from 1 st Jan to 31 st Jan in New Delhi organized by NCC.Prior to this, she also attended camps in Jodhpur and Jaipur. She got selected as Rajasthan AirWing best cadet and also secured fourth position in All India Best Cadet competition. All India merit list is prepared after a series of rounds like written test, firing competition, drill competition,group discussion,communication skill test etc. Presently, Harshita is a NCC cadet of 4 Raj Air Squadron. 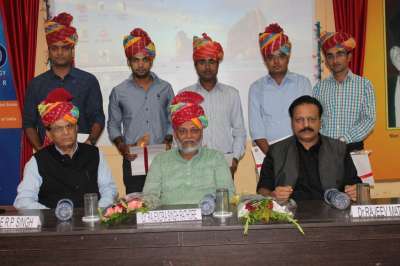 “Jodhpur Mathematical Hub “, first of its kind in Rajasthan was founded in Maths department of Lachoo Memorial College of Science and Technology on 19.1.2019.It aims on making Mathematics simple,interesting, easy and conducting various events.The inscription was unveiled by Prof. Gulab Singh Ji Chouhan(Vice Chancellor,JNVU). The organization is headed by Dr. Prof. Vivek Vijay(IIT,Jodhpur) and Dr. G.S. Sisodiya(Head,Maths department,LMCST) will be the secretary of the hub. Dr. Punit Saraswat, head, Department of Zoology and Environmental Sciences were felicitated at Tirchy, Tamil Nadu, as the “BEST INNOVATIVE RESEARCH IN FISHRIES &amp; ENVIRONMENTAL POLLUTION” by the International Journal of Research under literal access, Malaysia. Dr. Punit Saraswat , head, Department of Zoology and Environmental Sciences delivered an oral presentation on NOISE POLLUTION of Jodhpur at The International Conference ICRST – 2018 on WORLD ASSOCIATION FOR SCIENTIFIC RESEARCH AND TECHNICAL INNOVATION (WASRTI) held on 29 th - 30 th June 2018. 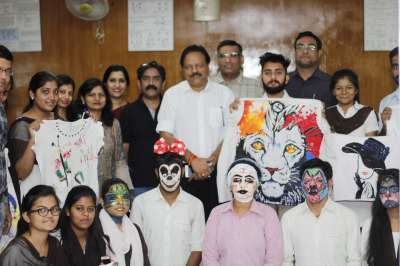 Day two of Carpediem held on 23rd October had events like T-Shirt/Face painting, Documentation/Presentation Design,Isharao Isharo Mein,TechKarti and Tamas.It was followed by prize distribution to the winners. In T-shirt Painting Asha MAnkad and Akshay Jangid stood first while Sejal Loadha,Sandhya GAur stood second.In Face Painting Asha MAnkad and Akshay Jangid stood first while Kriti Arora and Annapurna GAur stood second.Rishabh vaishnav and Garvita Dave were winners in Document Design while Bhawana Bhatiya nad Arihant Detha stood first and second respectively in Presentation Design.Isharo Isharo mein :Varsha's team stood first while Kuldeeps's team stood second . Amit Kumar and Jagrit goyal were respective winners from Overnight problem.Participation certificates were awarded to all participants. The day had interesting fun hourly problems lined up. the program ended with a vote of thanks by the conveners. 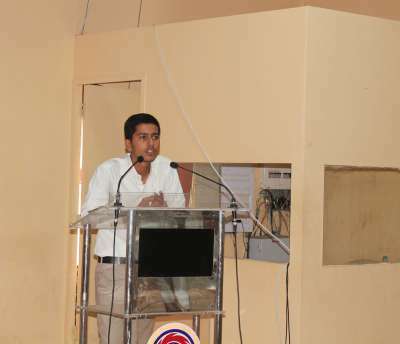 Two day event 'CARPEDIEM' of Faculty of Computer Science was held on 22nd and 23rd October. The day one started with inaugration by Principal Dr. Rajeev Mathur and Director, Dr. Priyadarshi Patni. Event conveners Dr Pallavi Upadhyaya and Dr. Arpita Mathur told that there were more then 800 participations across events from BCA, B.sc(Comp.Sc.) and MCA .The day one had web design,programming marathon,fix it main hoon na ,app ka idea events apart from 3 hourly problems. Vikas Khandelwal and Rahul Mamtani respectively stood first and second In WebPage Design for undergraduate and Diya taparia and vijay Jangid stood first andsceond for MCA. KAran Singh Solanki and Utkarsh Bhati respectively stood first and second In Programming Marathon for undergraduate and Rishabh Dadhich and Amitabh Kalla stood first and sceond for MCA. Fix It event winners were Raishabh Dadhich and Himanshu Pareek respectively from MCA.In App ka idea Avinish PAnwar and group stood first while Harsh Bohra and group stood second. In Main hoon na kritika gajja stood first while annapurna Gaur stood second. Pukhraj Mathur Memorial All Rajasthan English Debate Competition was organized on 26.10.18. 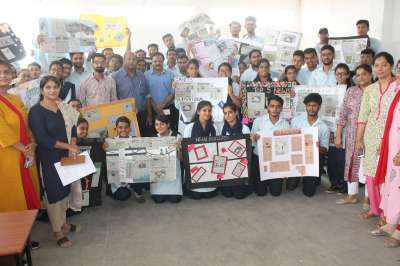 A total of 13 teams participated in the competition namely Team AIIMS, Team NLU, Team Kanodia, Jaipur, Team JIET etc.The subject was “Media is responsible for decadence of Contemporary Society”. Ambika Ratnoo of K.N. College was winner. Kashish Rajpurohit of Somani College and Vishal Kumar Sahoo of AIIMS, Jodhpur got 2ndposition. Anjali of Lachoo College stood 3rd in competition. Jwaladas Memorial All Rajasthan Quiz Competition was organized on 26.10.2018. A total of 13 teams participated in the competition namely Team AIIMS, Team NLU, Team Kanodia, Jaipur, Team JIET etc.. First position was grabbed by Jagriti- Sahil of AIIMS, Jodhpur and Nikhil Mishra- Mudit Burad of National Law University stood 2nd. Principal Dr. Rajeev Mathur interacted and took feedback from the students of NUSSD programme. 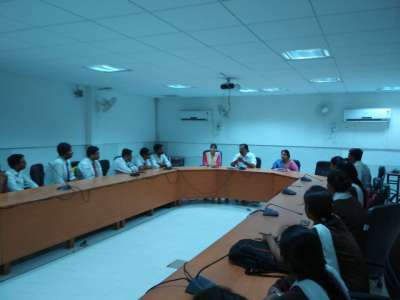 Course college convenor Dr. Vandana Gupta and course coordinator Mrs. Kanchan Jasmatiya along with Principal interacted with the students. Faculty of Commerce and Management Studies have organized World This Week competition for students of BBA Sem I and B.Com Sem I. 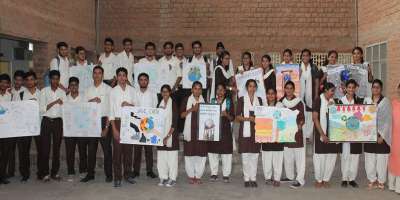 Students had prepared and presented collage on last week's top 5 news. Gaurav, Ravi grabbed 1st position while Lakshyadeep, Vidhi secured 2nd and Yashvardhan, Kuldeep got 3rd position. 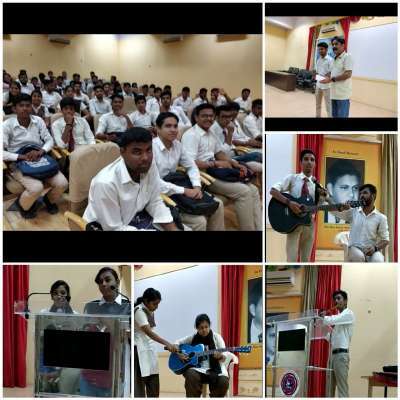 An Extempore competition was held for BCA I Semester students on 25th July.More then 30 students from I sem participated in the event.Kritika Gajja stood first , Harsh stood second and Hritik came third. Students enjoyed speaking on the topics on the spot like Har aadmiapnedukhonmein khoya hai, Social media = time waste , 3 best things about this college.Certificates were given to winners and participants. 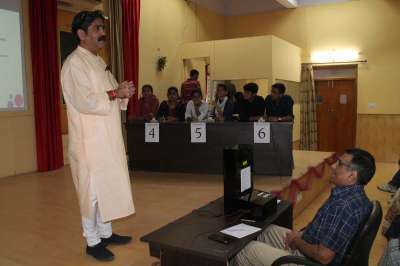 The event was judged by Dr Neeraj Mathur, Dr Deepak Mathur and Dr Arti Khanchandani. Orientation Programme for students of BSc, BBA, B.Com. and BCA was organized in the College where Prof. (Dr.) Rajeev Mathur, Principal congratulated students for their choice and gave information about college activities to them. Prof. Priyadarshi Patni, Controller of Examination and Dr Rajpal, Librarian also addressed the students updating about examination system in autonomous and library facility. A felicitation ceremony of five meritorious students of Lachoo Memorial College, selected in RAS examination 2017 was held in the auditorium on Friday, 10th November, 2017. The programme was graced by the presence of distinguished guests who were Dr. R.P. Singh, Vice Chancellor, Jai Narain Vyas University, Jodhpur and Dr. Rajendra Singh renowned water conservationist from Rajasthan. They were felicitated with Safa, Momento and Appreciation Letter. The accolades were done by Dr. R.P.Singh and Dr. Rajendra Singh. 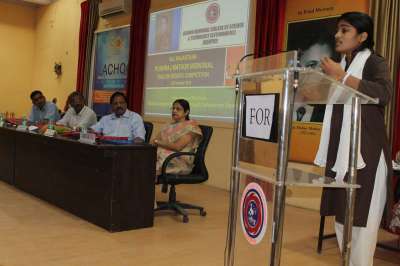 Honorable Vice Chancellor Dr. R. P. Singh congratulated the students and said that it was a matter of great honour and pride for him to felicitate the glistening pearls of Lachoo Memorial College. He further said that hard work, dedication and discipline are required to achieve success. Concluding his lines he advised the RAS selected students to understand the social causes of society and work for them. Pharmacy Week in the college. 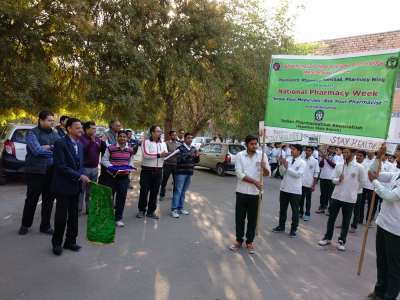 Pharmacy week was celebrated in the college on 8/2/18 and 9/2/18 in the premises. The first day had Literary and Scientific activities and second day witnessed Awareness Rally, Blood Donation camp and Health camp. The Program was conducted in collaboration with Pharmacy Council and Pharmaceutical Association. The commencement of the week was done with a talk by Prof (Dr) B.P.Nagori, Director Pharmacy wing on the topic 'Opportunities in Pharma Industry' and 'Growth and communication and coordination in Pharmacy Education' He also stressed on Spiritual Health and All Round development. 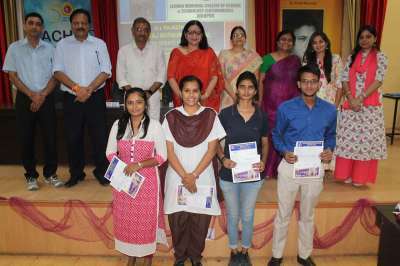 An essay Competition was organized on the Topic ‘Role of a Pharmacist’ under Literary and Scientific planet followed by Poster Presentation, Extempore, Quiz, and Group Discussion. The Programmes for second day started with a Rally Creating Health awareness and proper use of medicines. The message was passed using Posters and Banners. Mr. Sachin Mathur, Vice President, Management Committee, Lachoo College, showed the flag for the Rally. Under the Swatch Bharat Abhiyan students of Pharmacy contributed clearing the Herbal Garden of college and planted Trees in college premises. Mr. Praveen Mathur President Management Committee, Lachoo College, Mr. Sachin Mathur, Vice President Management Committee Lachoo College, and Prof (Dr) B P Nagori, Director Pharmacy also showed their graceful presence in the program and contributed in Tree Plantation. 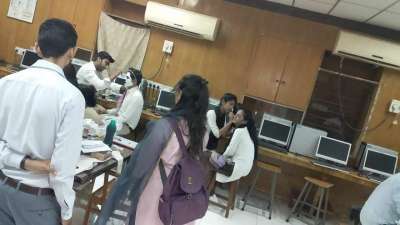 A Medical Health Camp and Blood Donation camp was organized by Agarsen Relief Society in which more than 150 student and Teachers availed the BMI test Blood Sugar Test and B P Test and more than 20 members donated the blood in the Blood donation camp. The day also witnessed Poetry Recitation, Song and Dance competition, Instrument Competition. In the end Dr Sanjay Gehlot under the Collaboration of Cipla Limited gave a talk on `Depression Awareness-Reasons and Remedies'. The Program was concluded with Prize Distribution for various Activities.